Download "At a glance in figures... 4. At a glance in words... 4. Foreword (by the Management Board)... 5. Group management interim report (IFRS)..."
4 4 AT A GLANCE IN FIGURES in thousand, unless otherwise indicated 3M M 2013 Δ in % Sales revenues 28,974 26,108 2, EBITDA 3,487 3, EBITDA margin (%) EBIT 1,388 1, Net profit for the period* 1,266 1, Cash flow from operating activities 1,120 1, Cash flow from investment activities Free cash flow 184 1, Number of shares in thousand 9,981 9, Earnings per share ( )* Incoming orders 30,416 27,041 3, Book-to-bill-ratio * For purposes of better comparability adjusted by PPA-amortization in the respective financial period. 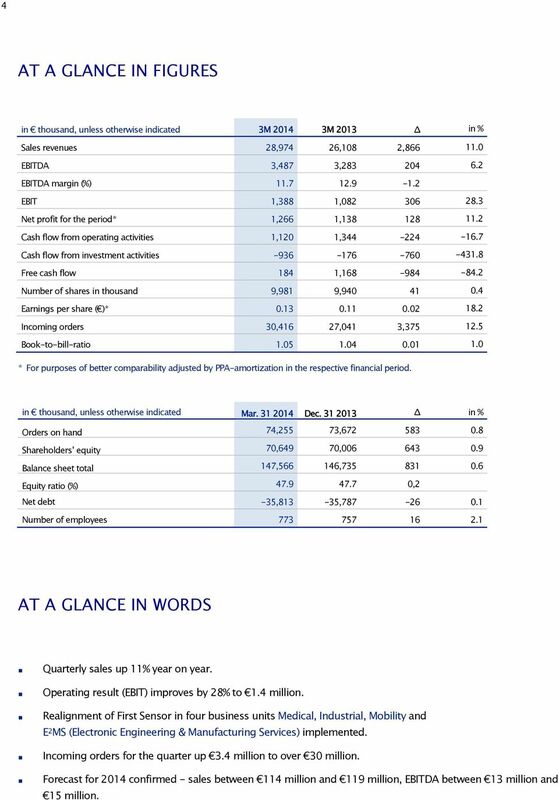 in thousand, unless otherwise indicated Mar Dec Δ in % Orders on hand 74,255 73, Shareholders equity 70,649 70, Balance sheet total 147, , Equity ratio (%) ,2 Net debt -35,813-35, Number of employees AT A GLANCE IN WORDS Quarterly sales up 11% year on year. 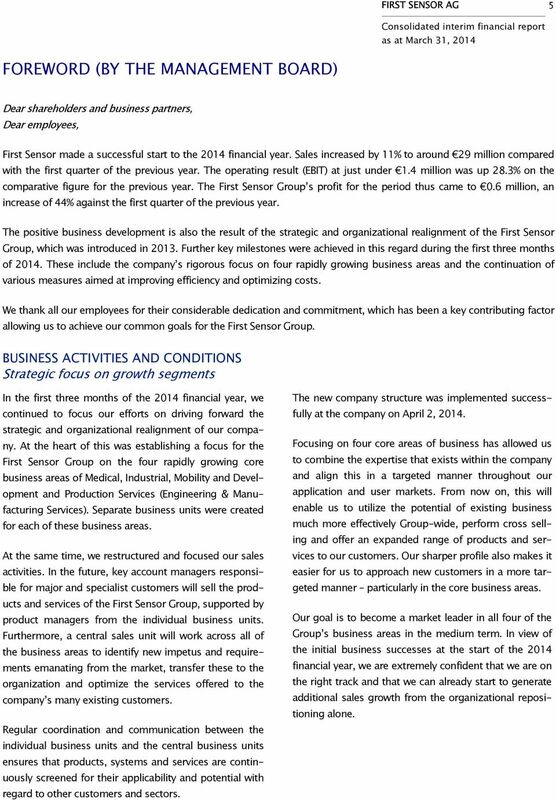 Operating result (EBIT) improves by 28% to 1.4 million. Realignment of First Sensor in four business units Medical, Industrial, Mobility and E 2 MS (Electronic Engineering & Manufacturing Services) implemented. Incoming orders for the quarter up 3.4 million to over 30 million. 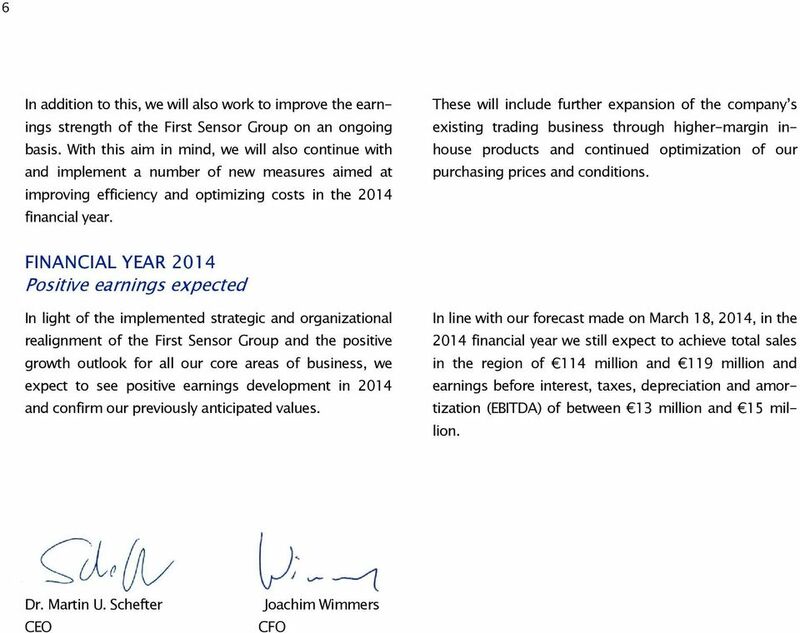 Forecast for 2014 confirmed - sales between 114 million and 119 million, EBITDA between 13 million and 15 million. 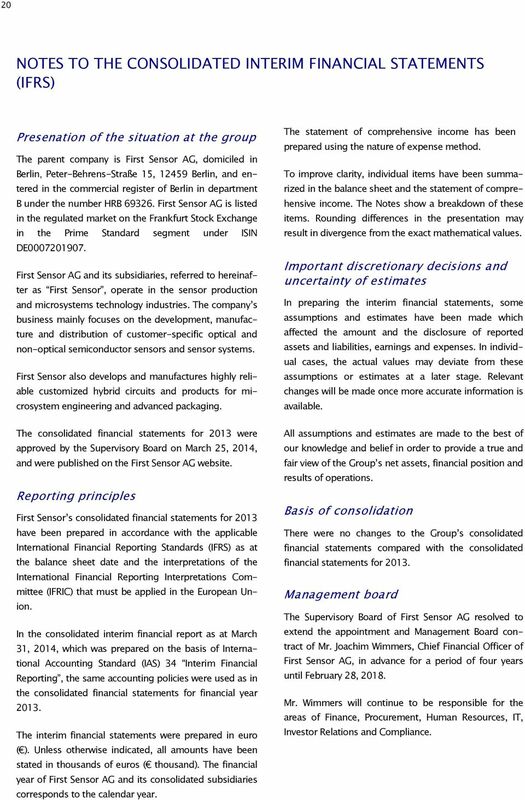 5 FIRST SENSOR AG 5 Consolidated interim financial report as at March 31, 2014 FOREWORD (BY THE MANAGEMENT BOARD) Dear shareholders and business partners, Dear employees, First Sensor made a successful start to the 2014 financial year. Sales increased by 11% to around 29 million compared with the first quarter of the previous year. The operating result (EBIT) at just under 1.4 million was up 28.3% on the comparative figure for the previous year. The First Sensor Group s profit for the period thus came to 0.6 million, an increase of 44% against the first quarter of the previous year. The positive business development is also the result of the strategic and organizational realignment of the First Sensor Group, which was introduced in Further key milestones were achieved in this regard during the first three months of These include the company s rigorous focus on four rapidly growing business areas and the continuation of various measures aimed at improving efficiency and optimizing costs. We thank all our employees for their considerable dedication and commitment, which has been a key contributing factor allowing us to achieve our common goals for the First Sensor Group. BUSINESS ACTIVITIES AND CONDITIONS Strategic focus on growth segments In the first three months of the 2014 financial year, we continued to focus our efforts on driving forward the strategic and organizational realignment of our company. At the heart of this was establishing a focus for the First Sensor Group on the four rapidly growing core business areas of Medical, Industrial, Mobility and Development and Production Services (Engineering & Manufacturing Services). Separate business units were created for each of these business areas. At the same time, we restructured and focused our sales activities. In the future, key account managers responsible for major and specialist customers will sell the products and services of the First Sensor Group, supported by product managers from the individual business units. Furthermore, a central sales unit will work across all of the business areas to identify new impetus and requirements emanating from the market, transfer these to the organization and optimize the services offered to the company s many existing customers. Regular coordination and communication between the individual business units and the central business units ensures that products, systems and services are continuously screened for their applicability and potential with regard to other customers and sectors. The new company structure was implemented successfully at the company on April 2, Focusing on four core areas of business has allowed us to combine the expertise that exists within the company and align this in a targeted manner throughout our application and user markets. From now on, this will enable us to utilize the potential of existing business much more effectively Group-wide, perform cross selling and offer an expanded range of products and services to our customers. Our sharper profile also makes it easier for us to approach new customers in a more targeted manner particularly in the core business areas. Our goal is to become a market leader in all four of the Group s business areas in the medium term. In view of the initial business successes at the start of the 2014 financial year, we are extremely confident that we are on the right track and that we can already start to generate additional sales growth from the organizational repositioning alone. 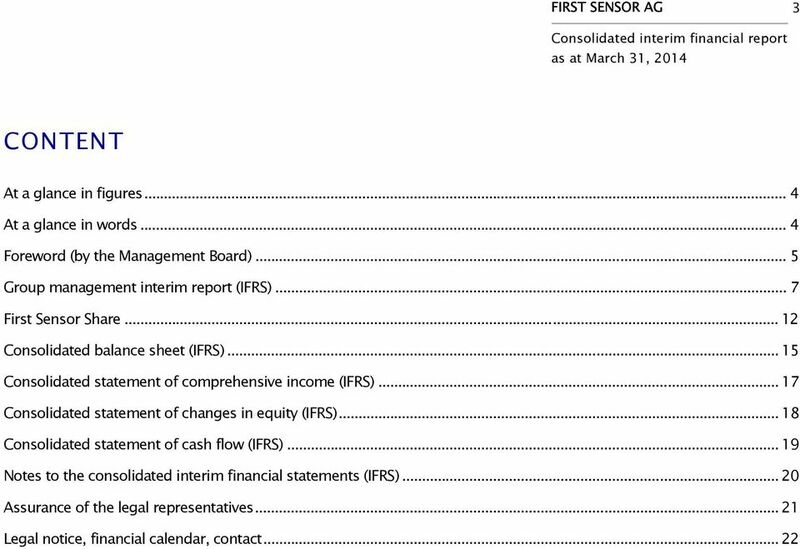 7 FIRST SENSOR AG 7 Consolidated interim financial report as at March 31, 2014 GROUP MANAGEMENT INTERIM REPORT (IFRS) BUSINESS MODEL Business activities and organization First Sensor is a developer and manufacturer of customer-specific high-end sensor solutions. These innovative specialized sensor solutions are used for the high-quality conversion of non-electric variables (radiation, light, pressure, flow rate, position, speed, fill level, etc.) into electric variables that are then used in our customers' electronic systems. First Sensor's sensor solutions are mostly used as key components in a wide range of applications in several different industries. Our core competencies include solutions in the area of optoelectronics, industrial cameras and MEMS sensor technology. 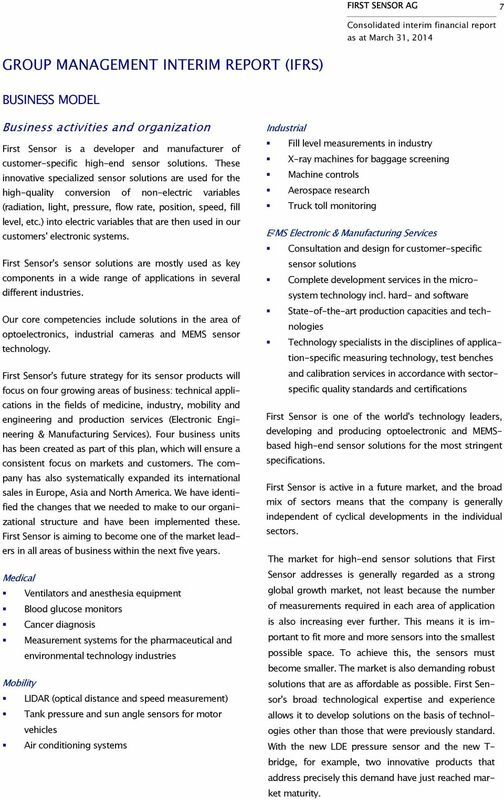 First Sensor's future strategy for its sensor products will focus on four growing areas of business: technical applications in the fields of medicine, industry, mobility and engineering and production services (Electronic Engineering & Manufacturing Services). Four business units has been created as part of this plan, which will ensure a consistent focus on markets and customers. The company has also systematically expanded its international sales in Europe, Asia and North America. We have identified the changes that we needed to make to our organizational structure and have been implemented these. First Sensor is aiming to become one of the market leaders in all areas of business within the next five years. Medical Ventilators and anesthesia equipment Blood glucose monitors Cancer diagnosis Measurement systems for the pharmaceutical and environmental technology industries Mobility LIDAR (optical distance and speed measurement) Tank pressure and sun angle sensors for motor vehicles Air conditioning systems Industrial Fill level measurements in industry X-ray machines for baggage screening Machine controls Aerospace research Truck toll monitoring E 2 MS Electronic & Manufacturing Services Consultation and design for customer-specific sensor solutions Complete development services in the microsystem technology incl. hard- and software State-of-the-art production capacities and technologies Technology specialists in the disciplines of application-specific measuring technology, test benches and calibration services in accordance with sectorspecific quality standards and certifications First Sensor is one of the world's technology leaders, developing and producing optoelectronic and MEMSbased high-end sensor solutions for the most stringent specifications. First Sensor is active in a future market, and the broad mix of sectors means that the company is generally independent of cyclical developments in the individual sectors. The market for high-end sensor solutions that First Sensor addresses is generally regarded as a strong global growth market, not least because the number of measurements required in each area of application is also increasing ever further. This means it is important to fit more and more sensors into the smallest possible space. To achieve this, the sensors must become smaller. The market is also demanding robust solutions that are as affordable as possible. First Sensor's broad technological expertise and experience allows it to develop solutions on the basis of technologies other than those that were previously standard. With the new LDE pressure sensor and the new T- bridge, for example, two innovative products that address precisely this demand have just reached market maturity. 8 8 ECONOMIC REPORT Changes in the basis of consolidation There were no changes in the basis of consolidation in the quarter under review. Earnings situation First Sensor s total sales increased over the quarter under review to 29.0 million, up 11.0% on the previous year s figure. This is largely attributable to the sales upturn in Europe and the initial success of sales optimization in North America. 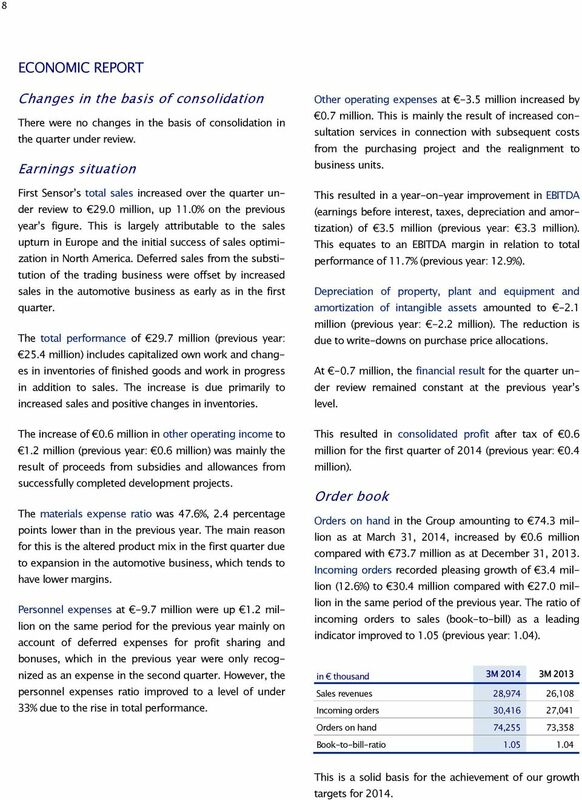 Deferred sales from the substitution of the trading business were offset by increased sales in the automotive business as early as in the first quarter. The total performance of 29.7 million (previous year: 25.4 million) includes capitalized own work and changes in inventories of finished goods and work in progress in addition to sales. The increase is due primarily to increased sales and positive changes in inventories. The increase of 0.6 million in other operating income to 1.2 million (previous year: 0.6 million) was mainly the result of proceeds from subsidies and allowances from successfully completed development projects. The materials expense ratio was 47.6%, 2.4 percentage points lower than in the previous year. The main reason for this is the altered product mix in the first quarter due to expansion in the automotive business, which tends to have lower margins. 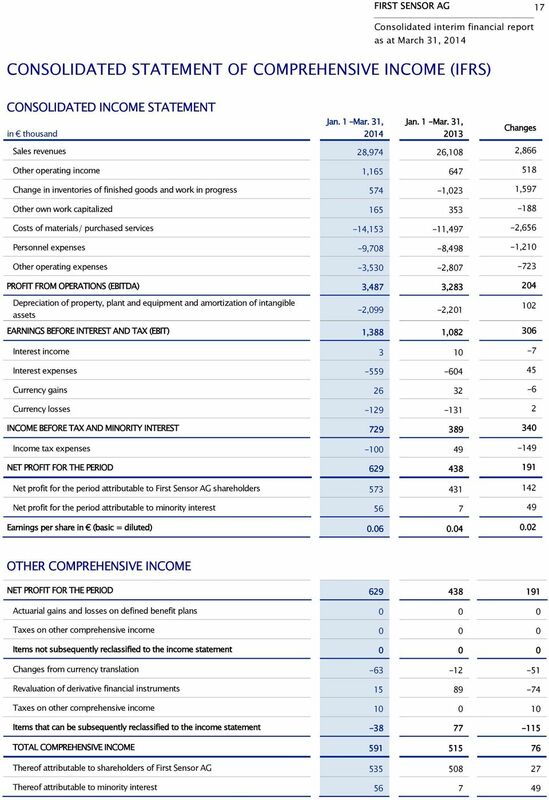 Personnel expenses at -9.7 million were up 1.2 million on the same period for the previous year mainly on account of deferred expenses for profit sharing and bonuses, which in the previous year were only recognized as an expense in the second quarter. However, the personnel expenses ratio improved to a level of under 33% due to the rise in total performance. Other operating expenses at -3.5 million increased by 0.7 million. This is mainly the result of increased consultation services in connection with subsequent costs from the purchasing project and the realignment to business units. This resulted in a year-on-year improvement in EBITDA (earnings before interest, taxes, depreciation and amortization) of 3.5 million (previous year: 3.3 million). This equates to an EBITDA margin in relation to total performance of 11.7% (previous year: 12.9%). Depreciation of property, plant and equipment and amortization of intangible assets amounted to -2.1 million (previous year: -2.2 million). The reduction is due to write-downs on purchase price allocations. At -0.7 million, the financial result for the quarter under review remained constant at the previous year s level. This resulted in consolidated profit after tax of 0.6 million for the first quarter of 2014 (previous year: 0.4 million). Order book Orders on hand in the Group amounting to 74.3 million as at March 31, 2014, increased by 0.6 million compared with 73.7 million as at December 31, Incoming orders recorded pleasing growth of 3.4 million (12.6%) to 30.4 million compared with 27.0 million in the same period of the previous year. The ratio of incoming orders to sales (book-to-bill) as a leading indicator improved to 1.05 (previous year: 1.04). in thousand 3M M 2013 Sales revenues 28,974 26,108 Incoming orders 30,416 27,041 Orders on hand 74,255 73,358 Book-to-bill-ratio This is a solid basis for the achievement of our growth targets for 2014. 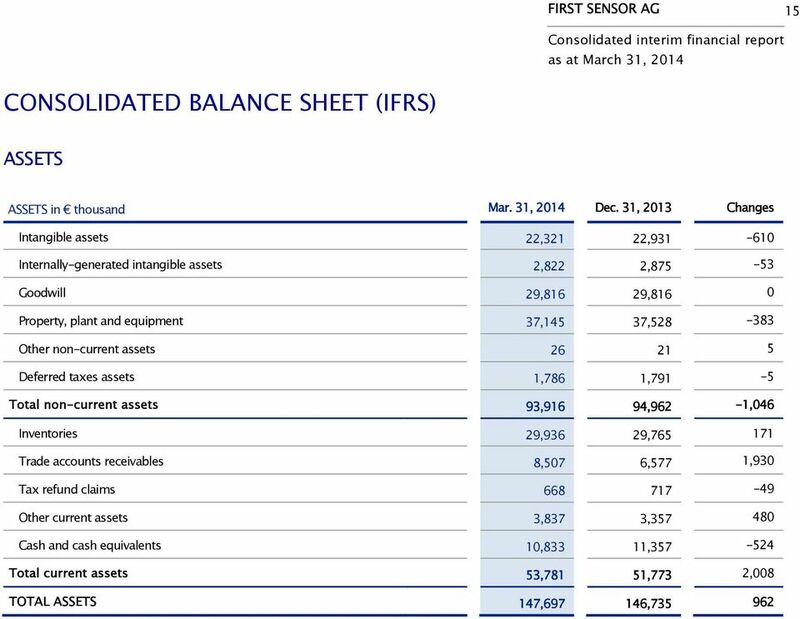 9 FIRST SENSOR AG 9 Consolidated interim financial report as at March 31, 2014 Financial analysis The aim of First Sensor's financial management is to ensure adequate liquidity at all times for the production processes, growth and investments. Promissory note loans totaling 31.0 million issued at the end of the 2013 financial year matured, resulting in loan repayments and interest payments for current loans in the first quarter of The following table shows net debt: Liquidity analysis In order to be able to assess First Sensor s solvency, the following table shows the company s liquidity in the form of liquidity ratios. To calculate the cash ratio, cash and cash equivalents are shown in relation to current liabilities. The quick ratio includes current receivables, while the current ratio takes into account inventories as well. The changes compared with the previous year show an improvement in all areas. in % Q in thousand Q Non-current financial liabilities -42,185-42,927 Current financial liabilities -4,461-4,217 Cash ratio Quick ratio Current ratio Cash and cash equivalents 10,833 11,357 Net debt -35,813-35,787 Non-current financial liabilities fell by 0.7 million in the first quarter of 2014 on account of loan repayments. Under current financial liabilities, there was increased utilization of overdraft facilities. Investment analysis Cash flow from investment activities of -0.9 million mainly relates to investments in machinery and equipment. The comparatively high figure for the previous year is due to the sale of Vereta GmbH. 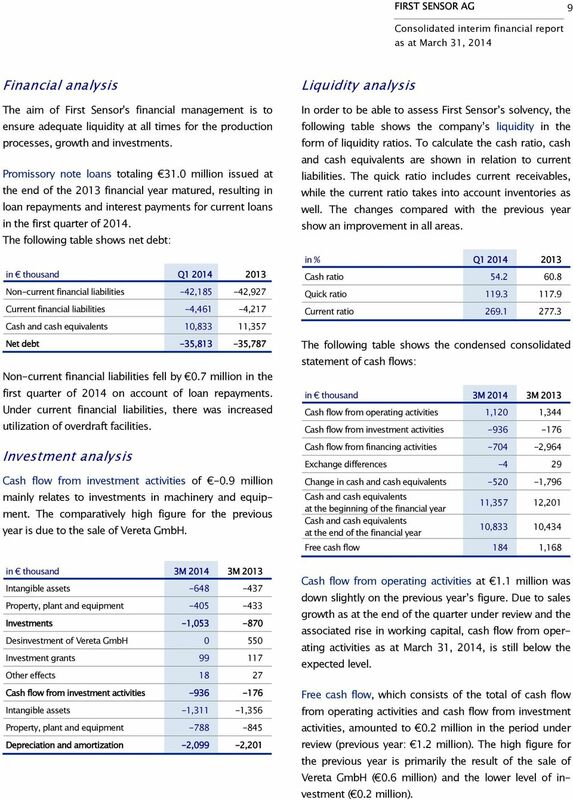 The following table shows the condensed consolidated statement of cash flows: in thousand 3M M 2013 Cash flow from operating activities 1,120 1,344 Cash flow from investment activities Cash flow from financing activities ,964 Exchange differences Change in cash and cash equivalents ,796 Cash and cash equivalents at the beginning of the financial year Cash and cash equivalents at the end of the financial year 11,357 12,201 10,833 10,434 Free cash flow 184 1,168 in thousand 3M M 2013 Intangible assets Property, plant and equipment Investments -1, Desinvestment of Vereta GmbH Investment grants Other effects Cash flow from investment activities Intangible assets -1,311-1,356 Property, plant and equipment Depreciation and amortization -2,099-2,201 Cash flow from operating activities at 1.1 million was down slightly on the previous year s figure. Due to sales growth as at the end of the quarter under review and the associated rise in working capital, cash flow from operating activities as at March 31, 2014, is still below the expected level. 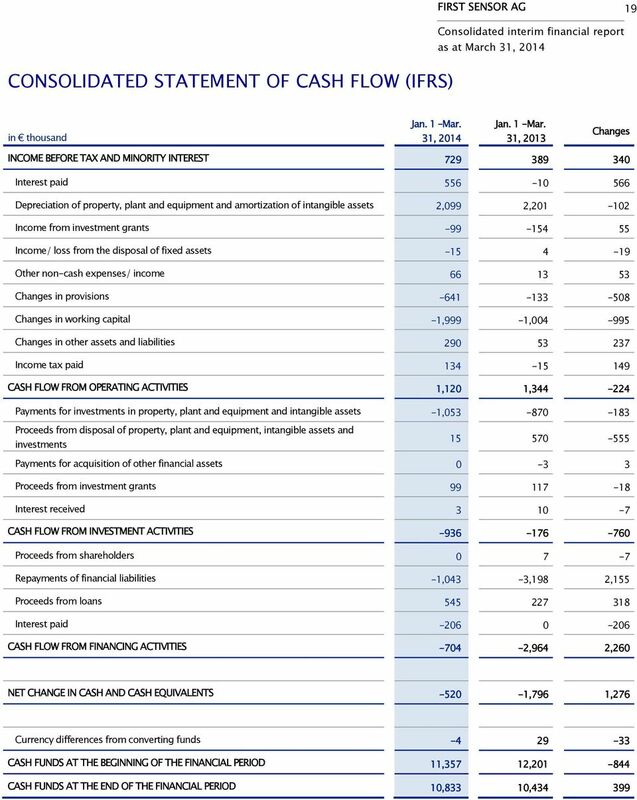 Free cash flow, which consists of the total of cash flow from operating activities and cash flow from investment activities, amounted to 0.2 million in the period under review (previous year: 1.2 million). The high figure for the previous year is primarily the result of the sale of Vereta GmbH ( 0.6 million) and the lower level of investment ( 0.2 million). 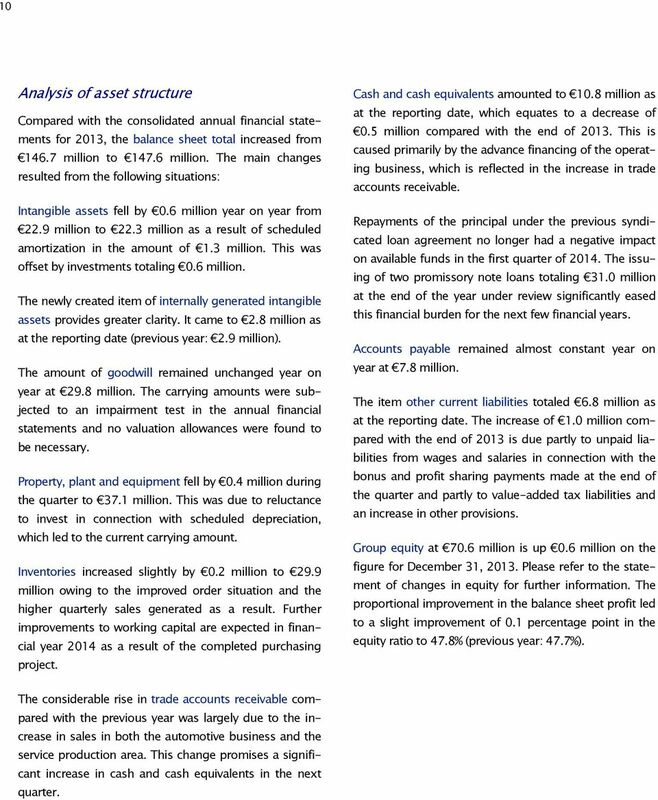 10 10 Analysis of asset structure Compared with the consolidated annual financial statements for 2013, the balance sheet total increased from million to million. The main changes resulted from the following situations: Intangible assets fell by 0.6 million year on year from 22.9 million to 22.3 million as a result of scheduled amortization in the amount of 1.3 million. This was offset by investments totaling 0.6 million. The newly created item of internally generated intangible assets provides greater clarity. It came to 2.8 million as at the reporting date (previous year: 2.9 million). The amount of goodwill remained unchanged year on year at 29.8 million. The carrying amounts were subjected to an impairment test in the annual financial statements and no valuation allowances were found to be necessary. Property, plant and equipment fell by 0.4 million during the quarter to 37.1 million. This was due to reluctance to invest in connection with scheduled depreciation, which led to the current carrying amount. Inventories increased slightly by 0.2 million to 29.9 million owing to the improved order situation and the higher quarterly sales generated as a result. Further improvements to working capital are expected in financial year 2014 as a result of the completed purchasing project. Cash and cash equivalents amounted to 10.8 million as at the reporting date, which equates to a decrease of 0.5 million compared with the end of This is caused primarily by the advance financing of the operating business, which is reflected in the increase in trade accounts receivable. Repayments of the principal under the previous syndicated loan agreement no longer had a negative impact on available funds in the first quarter of The issuing of two promissory note loans totaling 31.0 million at the end of the year under review significantly eased this financial burden for the next few financial years. Accounts payable remained almost constant year on year at 7.8 million. The item other current liabilities totaled 6.8 million as at the reporting date. The increase of 1.0 million compared with the end of 2013 is due partly to unpaid liabilities from wages and salaries in connection with the bonus and profit sharing payments made at the end of the quarter and partly to value-added tax liabilities and an increase in other provisions. 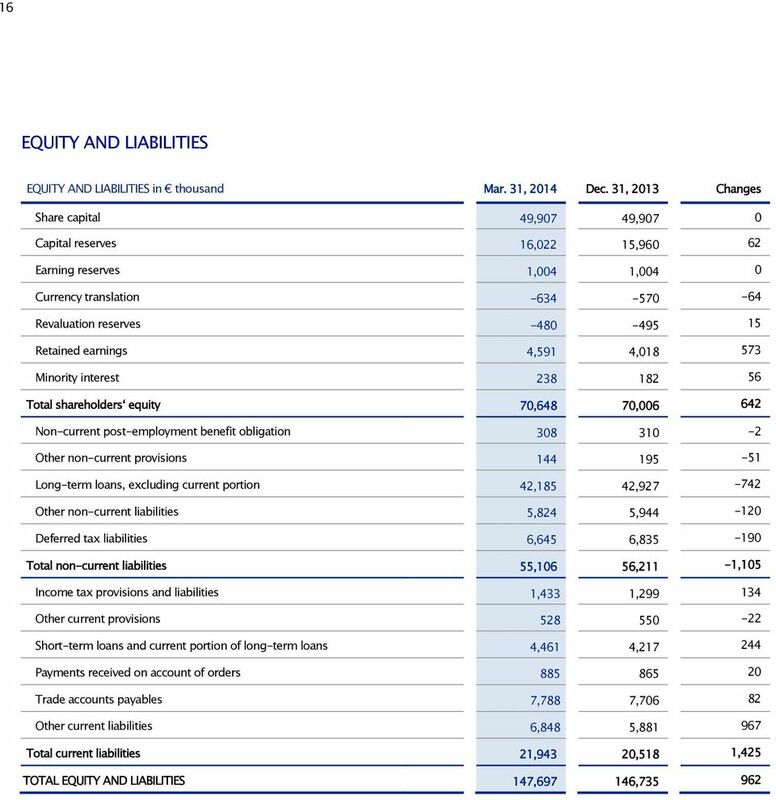 Group equity at 70.6 million is up 0.6 million on the figure for December 31, Please refer to the statement of changes in equity for further information. The proportional improvement in the balance sheet profit led to a slight improvement of 0.1 percentage point in the equity ratio to 47.8% (previous year: 47.7%). The considerable rise in trade accounts receivable compared with the previous year was largely due to the increase in sales in both the automotive business and the service production area. This change promises a significant increase in cash and cash equivalents in the next quarter. 11 FIRST SENSOR AG 11 Consolidated interim financial report as at March 31, 2014 SUPPLEMENTARY REPORT There are no important situations that have arisen since the end of the reported period. OUTLOOK, OPPORTUNITY AND RISK REPORT For reporting on the outlook, opportunity and risk report please refer to the information contained in the business report for the 2013 financial year, which was published at the end of March No material changes to the situations described therein have occurred during the first three months of financial year 2014. 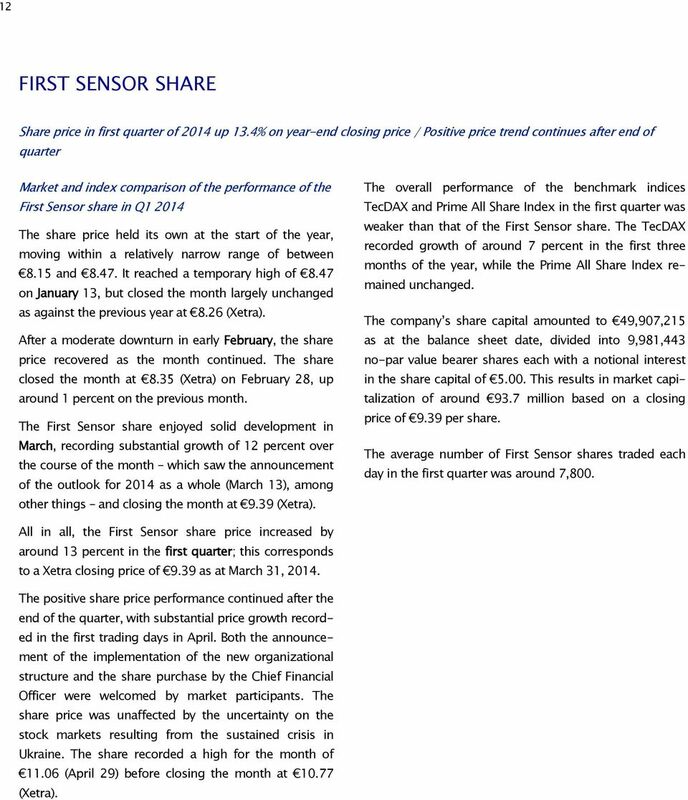 12 12 FIRST SENSOR SHARE Share price in first quarter of 2014 up 13.4% on year-end closing price / Positive price trend continues after end of quarter Market and index comparison of the performance of the First Sensor share in Q The share price held its own at the start of the year, moving within a relatively narrow range of between 8.15 and It reached a temporary high of 8.47 on January 13, but closed the month largely unchanged as against the previous year at 8.26 (Xetra). After a moderate downturn in early February, the share price recovered as the month continued. The share closed the month at 8.35 (Xetra) on February 28, up around 1 percent on the previous month. 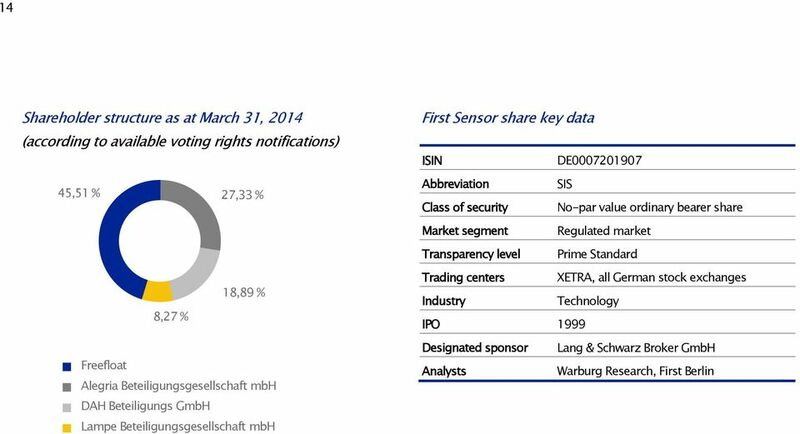 The First Sensor share enjoyed solid development in March, recording substantial growth of 12 percent over the course of the month which saw the announcement of the outlook for 2014 as a whole (March 13), among other things and closing the month at 9.39 (Xetra). The overall performance of the benchmark indices TecDAX and Prime All Share Index in the first quarter was weaker than that of the First Sensor share. The TecDAX recorded growth of around 7 percent in the first three months of the year, while the Prime All Share Index remained unchanged. The company s share capital amounted to 49,907,215 as at the balance sheet date, divided into 9,981,443 no-par value bearer shares each with a notional interest in the share capital of This results in market capitalization of around 93.7 million based on a closing price of 9.39 per share. 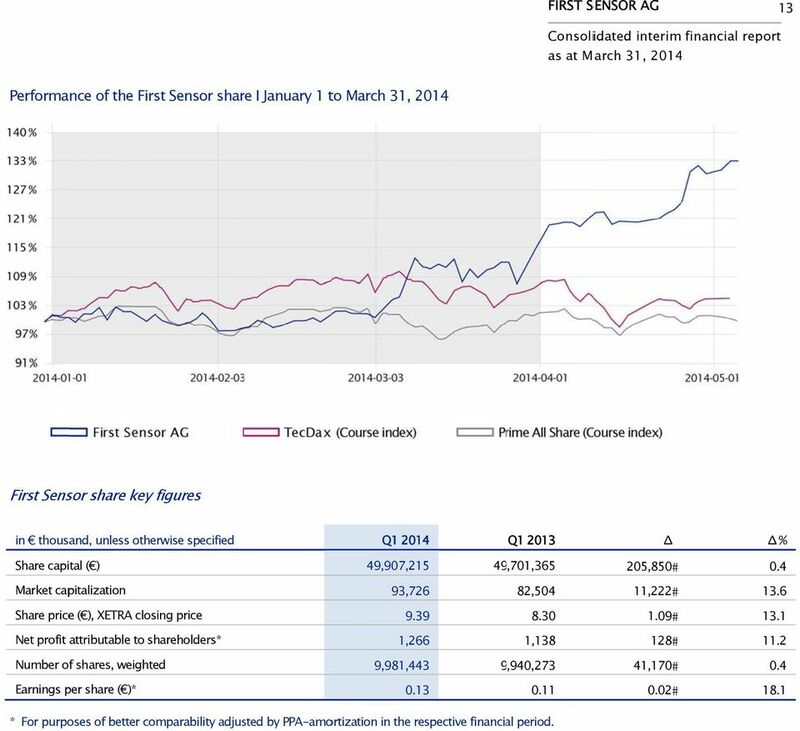 The average number of First Sensor shares traded each day in the first quarter was around 7,800. All in all, the First Sensor share price increased by around 13 percent in the first quarter; this corresponds to a Xetra closing price of 9.39 as at March 31, The positive share price performance continued after the end of the quarter, with substantial price growth recorded in the first trading days in April. Both the announcement of the implementation of the new organizational structure and the share purchase by the Chief Financial Officer were welcomed by market participants. The share price was unaffected by the uncertainty on the stock markets resulting from the sustained crisis in Ukraine. The share recorded a high for the month of (April 29) before closing the month at (Xetra). 13 FIRST SENSOR AG 13 Consolidated interim financial report as at March 31, 2014 Performance of the First Sensor share I January 1 to March 31, 2014 First Sensor share key figures in thousand, unless otherwise specified Q Q Δ Δ % Share capital ( ) 49,907,215 49,701, , Market capitalization 93,726 82,504 11, Share price ( ), XETRA closing price Net profit attributable to shareholders* 1,266 1, Number of shares, weighted 9,981,443 9,940, , Earnings per share ( )* * For purposes of better comparability adjus sted by PPA-amortization in the respective financia al period. 20 20 NOTES TO THE CONSOLIDATED INTERIM FINANCIAL STATEMENTS (IFRS) Presenation of the situation at the group The parent company is First Sensor AG, domiciled in Berlin, Peter-Behrens-Straße 15, Berlin, and entered in the commercial register of Berlin in department B under the number HRB First Sensor AG is listed in the regulated market on the Frankfurt Stock Exchange in the Prime Standard segment under ISIN DE First Sensor AG and its subsidiaries, referred to hereinafter as First Sensor, operate in the sensor production and microsystems technology industries. The company s business mainly focuses on the development, manufacture and distribution of customer-specific optical and non-optical semiconductor sensors and sensor systems. First Sensor also develops and manufactures highly reliable customized hybrid circuits and products for microsystem engineering and advanced packaging. The consolidated financial statements for 2013 were approved by the Supervisory Board on March 25, 2014, and were published on the First Sensor AG website. Reporting principles First Sensor s consolidated financial statements for 2013 have been prepared in accordance with the applicable International Financial Reporting Standards (IFRS) as at the balance sheet date and the interpretations of the International Financial Reporting Interpretations Committee (IFRIC) that must be applied in the European Union. 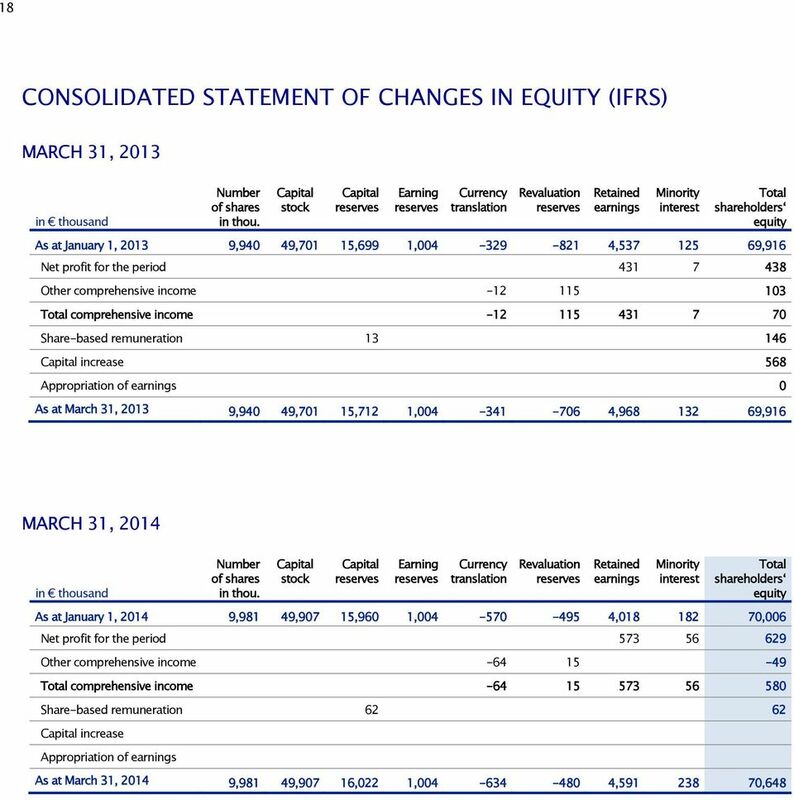 In the consolidated interim financial report as at March 31, 2014, which was prepared on the basis of International Accounting Standard (IAS) 34 Interim Financial Reporting, the same accounting policies were used as in the consolidated financial statements for financial year The interim financial statements were prepared in euro ( ). Unless otherwise indicated, all amounts have been stated in thousands of euros ( thousand). 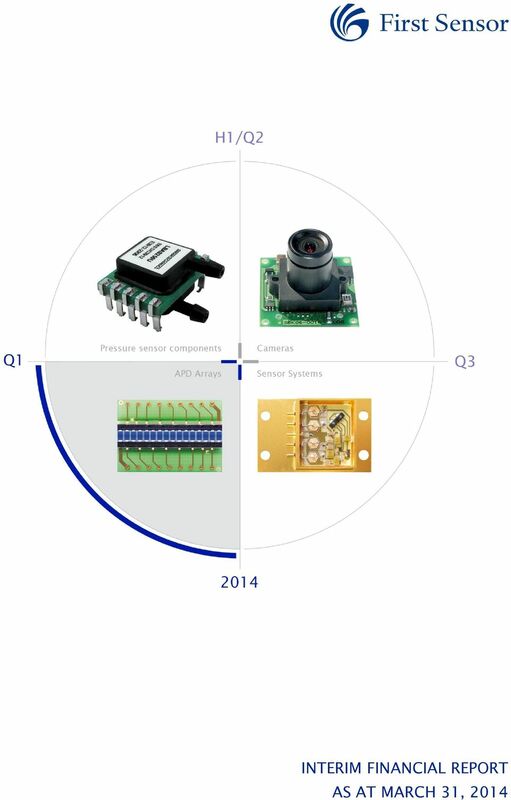 The financial year of First Sensor AG and its consolidated subsidiaries corresponds to the calendar year. The statement of comprehensive income has been prepared using the nature of expense method. To improve clarity, individual items have been summarized in the balance sheet and the statement of comprehensive income. The Notes show a breakdown of these items. Rounding differences in the presentation may result in divergence from the exact mathematical values. Important discretionary decisions and uncertainty of estimates In preparing the interim financial statements, some assumptions and estimates have been made which affected the amount and the disclosure of reported assets and liabilities, earnings and expenses. In individual cases, the actual values may deviate from these assumptions or estimates at a later stage. Relevant changes will be made once more accurate information is available. All assumptions and estimates are made to the best of our knowledge and belief in order to provide a true and fair view of the Group s net assets, financial position and results of operations. Basis of consolidation There were no changes to the Group s consolidated financial statements compared with the consolidated financial statements for Management board The Supervisory Board of First Sensor AG resolved to extend the appointment and Management Board contract of Mr. Joachim Wimmers, Chief Financial Officer of First Sensor AG, in advance for a period of four years until February 28, Mr. Wimmers will continue to be responsible for the areas of Finance, Procurement, Human Resources, IT, Investor Relations and Compliance. DEUFOL SE JOHANNES-GUTENBERG-STR. 3 5 65719 HOFHEIM (WALLAU), GERMANY PHONE: + 49 (61 22) 50-00 FAX: + 49 (61 22) 50-13 00 WWW. CENIT AG Systemhaus. Industriestraße 52-54 D-70565 Stuttgart Tel: + 49 711 7825-30 Fax: + 49 711 7825-4000 Internet: http://www.cenit. Quarterly Financial Report March 31, 2009 MBB Industries AG. Berlin Quarterly Financial Report March 31, 2009 MBB Industries AG MBB Industries in Numbers 03 MBB Industries in Numbers Three Month (Jan.
D.E MASTER BLENDERS 1753 N.V.